FarmgirlCyn: This is NOT a food blog! This is NOT a food blog! I was so excited to show you my .50 cent find from a tag sale this summer...finally put to use! I inadvertently bought cumin seeds rather than ground, so I put a TBL of seeds in the mortar? 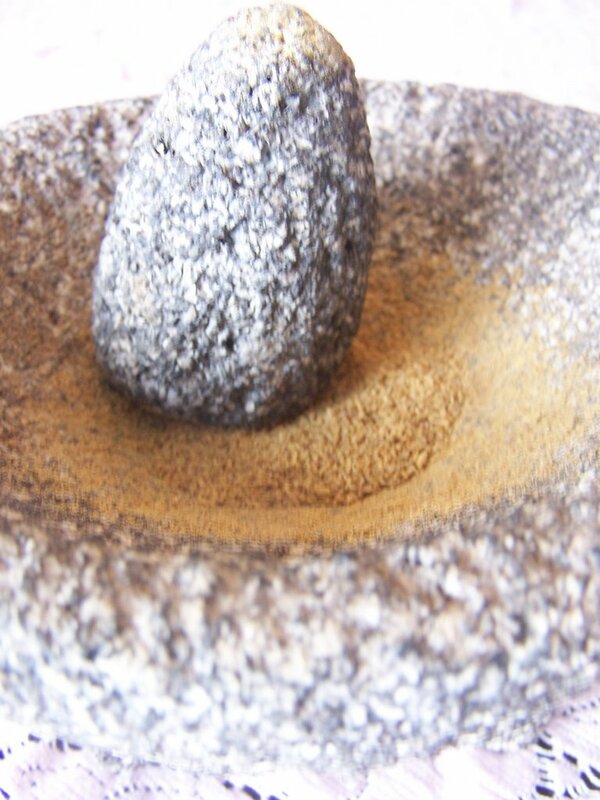 pestle?...which part is which???? and began to grind. After just seconds, I had semi-finely ground cumin for my re-fried ugly beans! 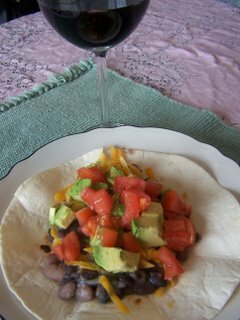 Which I then shmeared onto a "lightly browned on the gas stove-top", "Carb-Balance" flour tortilla, sprinkled judiciously with a bit of grated 2% Cheddar from Kraft, some fresh avocado, and chopped tomatoes. On the side, just for the photo, of course, is a glass of "Big House Red", a California table wine that I find more than adequate for an every day red. Well, yes, as a matter of fact it does, but we will have to wait several months till there are organic, heirloom tomatoes fresh from the garden on my lunch plate to discuss that! 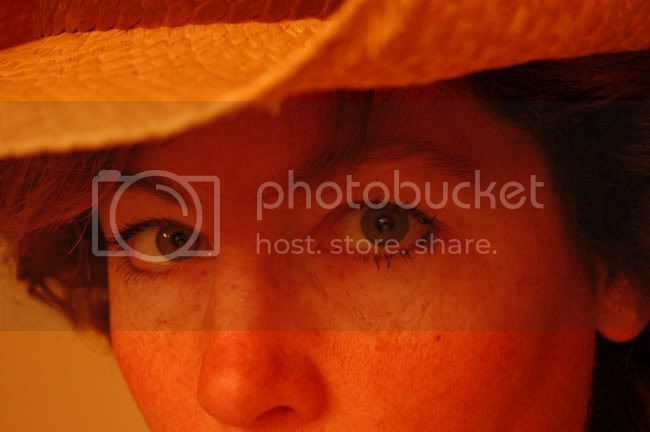 Look at me posting on Farmgirl Cyn without getting booted! Nice food blog here. Where's the beef? My mexican neighbors fed me Lange de baca tacos the other day and laughed afterwards...(cow tongue)I'm still alive. Then we had a nice cold bowl of cactus. It was HOT! I love cumin! I have never seen seeds before. Do they tasted the same? 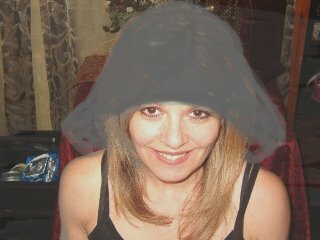 I use alot of Rachael Ray recipes and she uses cumin alot. Oh now you did have to mention fresh tomatoes off the vine!! Now I can't wait for the farmer's market to open! Looks good!! Lovella-how many times do I have to tell you all, this is NOT a food blog!!! laurie & chris-nice to have you stop by! 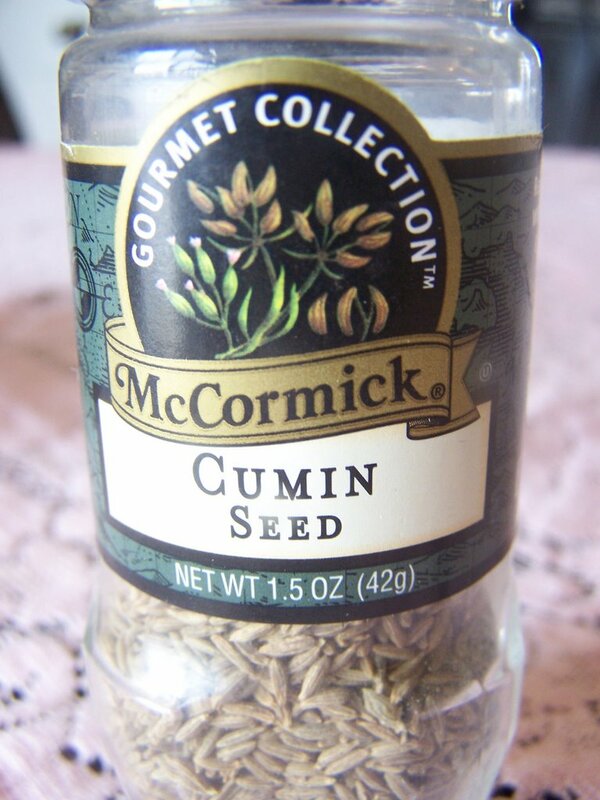 Cumin seeds taste just like the powder. They are a key component in chili and curry powders, and used a lot in Mexican cooking. I love the taste, but too much of a good thing can be too much. I start with a small amt, then add a tiny bit at a time. 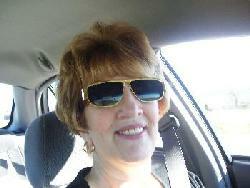 Rachel-Our farmers mkt opens sometime in April, but with mostly crafts, baked goods, and some perennials. The good stuff takes till the middle of summer. Can hardly wait. yummmmmy! I think my spanish man would love that as well as anything he's ever tasted! We loooooooove that sort of fare! and blah..the omelet is still rummblin but I do believe I would be able to put one of them away:)) this is a food blog a good one too! back to my bedy bye..
p.s. shocked that the kid with the long hair didn't get the boot tonight...the first of many shocks I spose! & oh yeah Lakisha has quite the set of pipes! Sure LOOKS like a food blog, let's ask Mimi...where's Mimi? Yummy!! Do you have any leftovers??? I only read Food Blogs, so I guess I'll have to stop reading yours ;) Just kidding! I thought for sure I left a comment on this...?? ?